The Bridge at McAlister Crossing (Mueller Bridge) is one of two multi-span Warren polygonal chord bridges in the state. 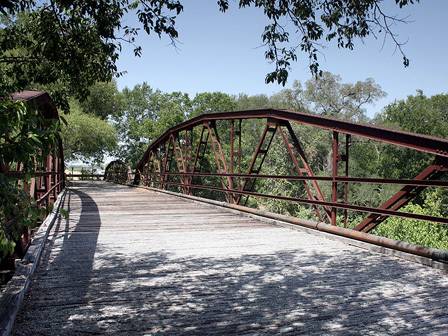 The 252-foot metal truss bridge with wooden floor was completed in 1915 and is located in Wilson County, two miles east of La Vernia. John McAlister bought several hundred acres of farmland in the area in the early 1850s adjacent to Cibolo Creek. The natural stream crossing, an old Indian trail, adjacent to his property became known as “McAlister Crossing”. Blacksmith Henry Mueller purchased land on the east side in 1906 and his son later settled the southwest side of the crossing. Serving residents for over 70 years, the bridge was closed to traffic in 1988. The abutment on the northeast end of the bridge is cracked and serious erosion problems have developed causing the northeast corner of the embankment to slough off leaving the corner dangling in mid-air. Several holes have developed in the flooring of the bridge.